Justice Thomas’s wife, Virginia, earlier this month called Anita Hill, now a professor at Brandeis University, seeking an apology. 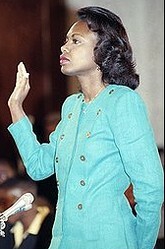 During Justice Thomas’s confirmation hearings in 1991, Hill alleged that Thomas, as her boss, had sexually harassed her at the Education Department and later at the Equal Employment Opportunity Commission. Thomas vehemently denied the allegations. “I did place a call to Ms. Hill at her office extending an olive branch to her after all these years, in hopes that we could ultimately get passed (sic) what happened so long ago,” Virginia Thomas said through a spokesman. Hill said she didn’t take Mrs. Thomas’s Oct. 9 voicemail as conciliatory. Hill said she initially assumed the call, which a Brandeis spokesman said came in at 7:30 a.m. on a Saturday, was a prank. She notified campus security, Brandeis spokesman Charles Radin said, which in a routine procedure alerted the Federal Bureau of Investigation.